A former railway line between High Peak Junction and Whaley Bridge, now a popular walking and cycling route known as the High Peak Trail, is once again playing a key role in keeping people connected, it was revealed today (Monday 29 March 2016). Completed in 1831, the trackbed of the Cromford and High Peak Railway used to carry minerals between the Cromford Canal wharf at High Peak Junction and Whaley Bridge before being turned into a trail for local walkers and cyclists in 1971. And now the trail has also become a highway for better, faster broadband after engineers from BT’s local network business, Openreach, laid more than 7 kilometres of underground cables along the route, between Steeple Grange and Longcliffe, so fibre broadband could reach nearby villages. The fibre broadband connection to villages around Brassington starts at the Matlock telephone exchange before travelling alongside the A6 towards Dethick. From there, it heads through Cromford on the B5036 before joining the High Peak Trail for the final leg of the journey. Steve Henderson, BT’s regional director for next generation access, said: “This was a particularly challenging piece of work with more than 15 kilometres of underground fibre needed to make high-speed broadband available to people living in this area. We always try to use existing infrastructure wherever possible, but in this case we needed the engineers to take around 7 kilometres of cabling along the High Peak Trail. The High Peak Trail is part of the National Cycle Network and runs from near Buxton to High Peak Junction, Cromford. It is connected to the Tissington Trail which runs for 13 miles between Parsley Hay to Ashbourne. Across the county, more than 430,000 homes and businesses now have access to fibre broadband thanks to Digital Derbyshire and BT’s commercial rollout. 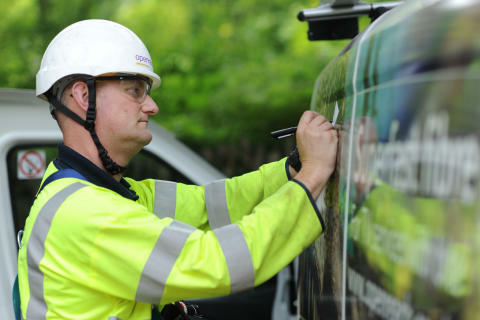 Work taking place as part of Derbyshire County Council’s partnership with BT is being carried out by Openreach, BT’s local network business, meaning people with access to the fibre network can choose from a range of internet providers and competitive pricing. The overall Digital Derbyshire project is being funded using £15.2 million from BT, £5 million from Derbyshire County Council, £9.7 million from the Government’s Broadband Delivery UK fund, £2.5 million from the European Regional Development Fund and £2.2 million from the D2N2 Local Enterprise Partnership. To find out more about Digital Derbyshire, visit the new and revamped website at www.digitalderbyshire.org.uk.